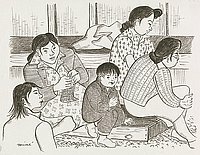 A woman standing in profile in the left foreground, Mine Okubo, observes a group of three woman and one boy seated together on a low wooden platform. One woman is knitting. Another has removed her jacket and placed it behind them on a higher platform. Signed at bottom left corner: Mine. Written in pencil, bottom right corner: 99. Written and circled in pencil, bottom left corner: 99. Stamped in black ink on back, top left corner: 5191. Written in pencil on back, bottom right corner: 99. Drawings for the book, Citizen 13660, began as sketches and drawings created by Okubo while incarcerated at Tanforan and Topaz to tell faithful friends about camp life and were intended for exhibition purposes. Drawing is on page 104 of book.